THE YOUNG SANGHA is a group of people mainly in their 20s and 30s who meet to discuss and practice meditation with a focus on the Karma Kagyu tradition of Tibetan Buddhism (though people from any spiritual background are welcome). It isn’t necessary to be a Buddhist to come to Young Sangha events; all that is needed is an open mind. Our events are designed for everyone and do not require any previous knowledge or experience. We hold retreats and events that involve both practise and discussion of the Buddha’s Teachings; with some events taking place at Marpa House in Essex, and some in London. The group is inspired by the teachings of Lama Chime Rinpoche. “Attending a Young Sangha retreat is such an important part of my year, as it gives me proper time to catch up with everyone else and, vitally, with myself. Every retreat I have been to, I have come away a better, more understanding, and patient person. The Young Sangha gives me an enormous sense of security. Being a Buddhist is for me a constant reminder of how to act toward people around you. Whenever I am tired, frustrated, or generally in a bit of a mood and perhaps not dealing with everyday stresses as well as possible, I think of Marpa House and my fellow Young Sangha, and my mood lightens”. “The Young Sangha gatherings felt like such a gentle way to explore Tibetan Buddhism – the atmosphere is so relaxed and friendly. I didn’t know anyone the first time me and my partner attended, but was met with great warmth! 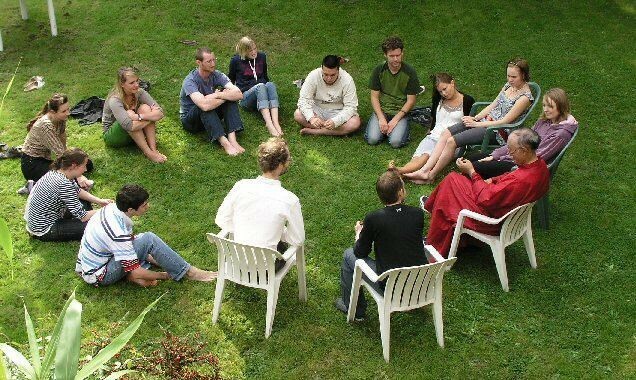 “The Young Sangha weekends are a lovely way to spend a fun, relaxing and memorable weekend at Marpa House. They provide an opportunity to “escape the real world”! I enjoy getting together with old friends, meeting new people, and learning more about Buddhism together. 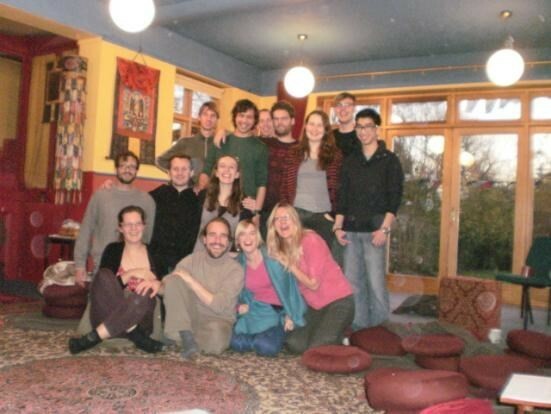 “In the past five years the Young Sangha has been a source of friendship and great joy for me. The first event I attended felt like coming home and since then the group has become an important part of my Buddhist practice. “For me the Young Sangha was and continues to be, a fantastic introduction to the teachings of the Buddha. Practising meditation with your peers makes it very accessible. The relaxed atmosphere allowed me to expand what knowledge I did have, re-think a lot I thought I knew and, most importantly, allowed me the space and access to ideas, which have deepened my meditative practice far beyond what I thought possible.